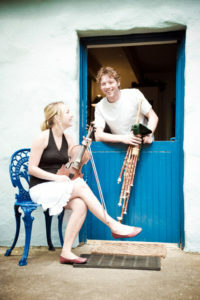 Described as “invigorating” by The Irish Times, Sophie & Fiachra take the Traditional Music of Québec and Ireland and mate it in a unique way, remaining true to their roots while creating a new and original sound. Their sound is rooted in the fiddling and singing of Québecoise Sophie Lavoie and the uilleann (Irish) piping and banjo-playing of Fiachra O’Regan from Ireland. Their sound is sweetened all the more by Gaelic and French Canadian song arrangements. This is no surprise given Sophie & Fiachra’s track record with delighting audiences throughout the world – and their deep love for and intimacy with their respective musical traditions. 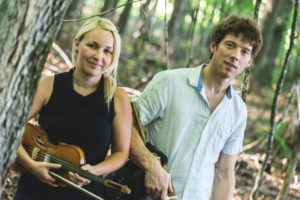 The duo Sophie & Fiachra has recorded three albums: Sophie & Fiachra (2010), Rewind (2014) and Un Canadien errant (2016), which was nominated for Best Album of the Year at both ADISQ 2016, the Québec music industry version of the Junos, and the 2016 Canadian Folk Music Award. Sophie and Fiachra have just released a new CD, Portraits, with renowned Québecois guitarist, André Marchand. The recording is receiving rave reviews across the Atlantic. Sophie Lavoie is a fiddler, pianist, singer and composer from Lac-St-Jean in Québec. She has played in various Québecois bands including L’attisée and Tu m’en diras tant. Since 2008 she has been touring with Irish piper Fiachra O’Regan. Sophie has recently been awarded a scholarship for a Masters in ethnomusicology at University of Montreal. Her research involves the fiddle style and repertoire of her native region, Saguenay-Lac-Saint-Jean. Fiachra O‘Regan, from Connemara on the West Coast of Ireland, plays Uilleann (Irish) Pipes and Whistle. He is a senior All-Ireland Champion on both these instruments. Fiachra has performed throughout the world, touring with his own group as well as with many other artists and groups. He is also sought after as a teacher in private lessons and at festivals. In 2008, Fiachra recorded Aisling Gheal, his first solo album, and has since recorded three albums with Québecoise fiddler Sophie Lavoie, as well as appearing as a guest on many other albums. More info can be found on his website: www.fiachrapipes.com. You can see videos of Sophie and Fiachra HERE.